Standard sharing / printing capabilities such as iTunes file sharing, copying / saving to iDisk and on a WebDav server and emailing your document are all present, and the documents can be saved / printed as a PDF, an OmniGraffle document and as pictures in your camera roll. Also, taking cues from Mac OS X Lion (or maybe its the other way around) documents and its changes are automatically saved locally. Even after the application crashes (which in my experience is primarily due to my fault, since I’m a multi-tasking freak), you will be relieved to see that all the changes that you have made are saved automatically, which is very good. 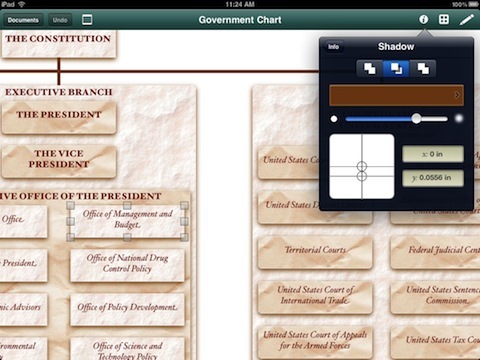 OmniGraffle document? Yup, you heard right, and it is compatible with its big brother counterpart and vice versa; this means that you can do that big and complicated document on your Mac, transfer the file to your iPad (or transfer the file to your WebDav account), add the final touches to your document on the go, then pop in your AV iPad connector and start projecting your document to your dedicated audience! (yes it is compatible with Apple’s VGA Adapter, but its the only one I have so its the only one that I have tested it on) Once completed, do the changes on the go, then transfer file back to the Mac. That’s both productive and very convenient! Also, due to iOS 4’s copy and paste functionality and multi-tasking, you can create the diagrams / images in OmniGraffle then “copy the image / diagram” to the program you want to use it on (say Keynote). But as good as it is, it still has some flaws. 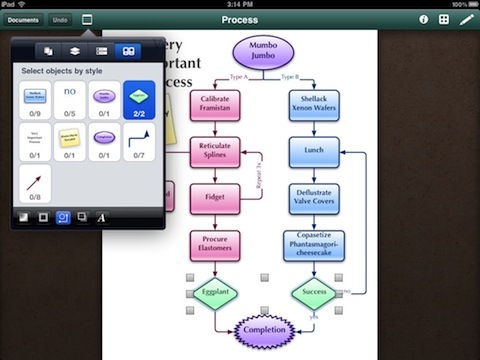 First, it has no “syncing” feature via a Desktop Client or anything of the sorts, much again like the iWork software. This is a much needed feature for obvious reasons. Most softwares / applications get around this feature by giving you access to files stored in your Dropbox account from the application. Sadly, there is no Dropbox integration in OmniGraffle. WebDav is good, but very few online cloud storages offer WebDav, and most costs a monthly subscription fee to use. In actuality, this should post no problems, but due to the high price tag of this software (priced at $49.99) most users wouldn’t like to pony up the added cash just for the WebDav storage. I have also encountered an issue when exporting multi-canvas diagrams into pictures: only the first canvas is exported. I am not sure if this is hardware-related since I am using 1st generation iPad. Having the ability to export all canvases to pictures would be nice. Lastly, though the software is indeed integrated with Graffletopia, some stencils are not compatible with the iPad OmniGraffle. 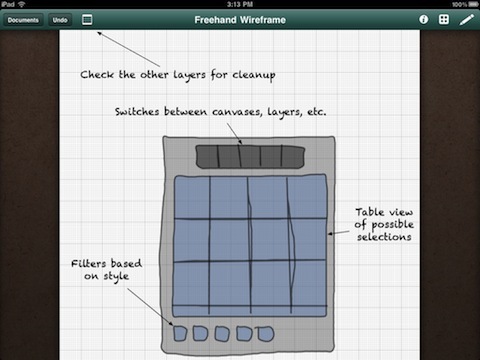 It would be nice to have a filtering system within the app or Graffletopia that would allow iPad users to download only iPad – compatible stencils. Final thoughts: the OmniGraffle is a brilliant application, which is just as good if not better than its Mac Counterpart. However, lacking some essential features (that should be a standard feature) coupled with its high price prevents this application from being a grand slam winner. It is still a must-buy, if you have the cash though. AppSafari review of OmniGraffle was written by John Tinio on June 27th, 2011 and categorized under App Store, Developers, iPad apps, Productivity, Utilities. Page viewed 6388 times, 2 so far today. Need help on using these apps? Please read the Help Page.